As of 13 April 2017, 427,651 (416,749 last month) of 640,000 files are available online via the LAC Soldiers of the First World War: 1914–1918 database. The latest digitized is from Box 7260 (7059 last month) and last name Nelles (McLelland). 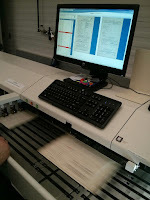 Library and Archives Canada is digitizing the service files systematically, from box 1 to box 10686, which roughly corresponds to alphabetical order. 10,902 (12,585) files were digitized in the last month. At that rate the project would be complete by November 2018. It's unlikely it will be that late as this reporting period is particularly short.